We are so excited to welcome the first baby animal rescue in over a decade, and also the first rescue of 2019. The Washington Department of Fish and Wildlife put out the call for a home for the wild cat when residents in a Washington neighborhood reported the four-month-old orphaned cougar in their backyards. The wild-caught cougar has yet to be named. 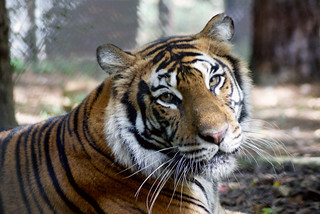 As an intern at Carolina Tiger Rescue, you will learn all that goes into caring for big and small cats for an eight-week period. It’s 2019 and time to consider what the path your life is taking and your values. Here are some simple ways that you can stand against the exploitation of animals and protect wild cats in their natural habitats.